You might call Frank and Lynne Titus’ Gibson City house the Anne of Green Gables of homes — charming and imaginative. The orphan girl was featured in the most popular book in 1909, the same year the house was built. While the house was built in the age of silent films and Model T’s, it’s still an animated, dynamic home. Lynne first saw the house when she was driving around with a friend. “I said, ‘I don’t want that thing; it’s way too big,’” Lynne remembered. She quickly changed her mind, though. The Tituses did not do anything to the house until 2012. Once they got started, it took them three years to complete the renovations. During the renovation process, it wasn’t unusual for the Tituses to come home to find curious strangers in their home, asking the workers about it. “Everybody in town would drive by and do a lap around,” Lynne said. The aging home needed some basics. The old wiring was knob-and-tube, and there was a shortage of electrical outlets. Because it was going to cost more to run wiring under all of the interior walls, the Tituses decided to remove them. Foam insulation has been put in the exterior brick walls; Lynne used to bundle up in blankets as cold air invaded. The Tituses had a photograph of the home’s exterior, so they used that as a guide when rebuilding the front porch. “I wanted it to look the way it was originally,” Lynne said. 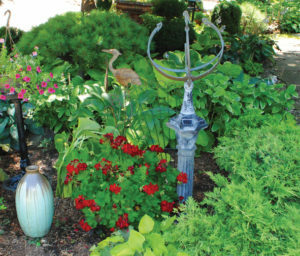 Lynne, a former school librarian, researched the home’s history and found that the original owner, Charles Helmick, built the home in 1909 at a cost of $20,000. “That would be like millions today,” Lynne remarked. There have been numerous owners over the years, and it served as a boarding house at one time. The Tituses had to remove sliding chain locks from all of the upstairs bedrooms, where boarders had lived at one time. The home was about 3,600 square feet before the Tituses built an addition. Where a pantry had once been off of the kitchen, a previous owner had put in a half-bathroom. The Tituses didn’t like the bathroom’s lack of privacy, and Lynne decided she wanted a pantry put back there instead. At the back door, his-and-hers bench seats, cubbyholes and hooks provide convenient storage space. “Before you’d have to walk all the way through the house to hang up your coat,” Lynne explained. In the full basement under the addition, there is a heated floor, which helps Frank maintain the ideal fermentation temperature of 68 to 72 degrees in the wine-making room under the patio. The space is furnished with a bench made from old GCMS bleachers. Another memento of the school he retired from in 2011 is a wall featuring drum heads – arranged in the shape of mouse ears — signed by the Marching Falcon band members he took to Walt Disney World. A room at the front of the house had originally been a parlor, but Lynne had a carpenter put in shelving for her books to make it a library. The wood was matched as closely to its surroundings as possible, and they used reproduction wallpaper. “Every decision we made, we wanted it to look like this was the original house,” Lynne said. Lynne researched and discovered soapstone would have been used for kitchen countertops when the home was built. She likes the material because she can put down hot dishes without worrying about damaging it. Lynne wanted wainscoting, which would have been typical of a home of that period, but she wanted it taller than usual. 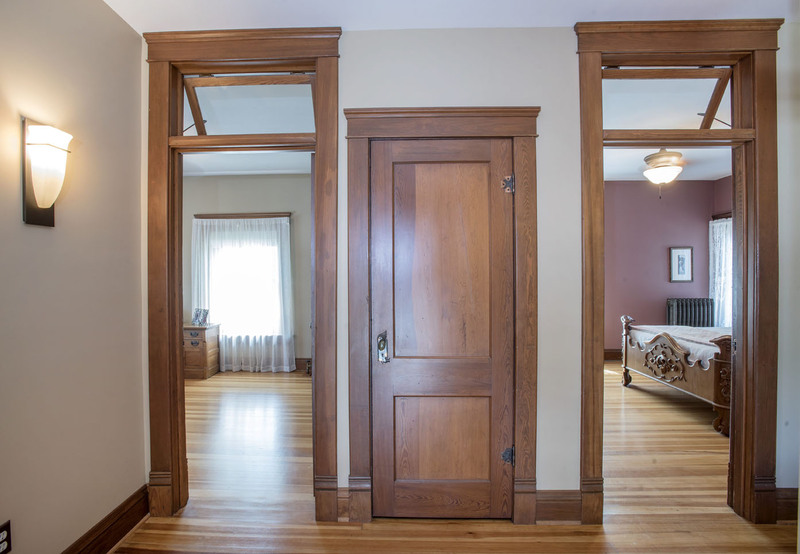 The home has craftsman-style details, so Lynne wanted her cabinets built in that style. “I’m a cook, and I wanted a nice kitchen,” Lynne said. Every bedroom upstairs has a transom above the doorway, so they built one above the kitchen doorway to resemble those. “It makes it look like it might have always been here,” Lynne said. The appliances are modern. “It looks like an old home, but it has the convenience of being brand new,” Lynne said. The kitchen has a secret: Behind what appears to be a cabinet door is a back stairway that once led to the maid’s upstairs bedroom. Fretwork at the top of the doorways is original to the home. Light fixtures are also original, as are the pocket doors between all of the rooms. The Tituses found plate rails in the attic and put them back on the dining room walls where they had once been. All of the windows used weights that ran up and down and were not energy-efficient. “They were so drafty,” Lynne said. The home’s open design presented some challenges; in the living room, for example, there were no walls to put a couch against. An original, working fireplace highlights the room. Although the home is large for two people, it is helpful when the Tituses host relatives during the holidays. “That’s when it makes sense,” Frank said. Upstairs, the Tituses had to strip woodwork that had been painted over. Every piece taken down was painstakingly marked to ensure that it was returned to the proper location. Carpet was removed to reveal the original hardwood floors, which were sanded and refinished. “Each room had a closet, which was not common back then,” Lynne said. The Tituses still use the home’s radiators. “They provide heat for the entire house,” Lynne said. The family did without central air until the renovations, utilizing two zoned air-conditioning units to cool the upstairs and downstairs in the meantime. The upstairs hallway had no lighting in it, so they added sconces. One of the bedrooms is furnished with an almost-queen-size bed from the early 1800s. An antique dresser that had been stored in a shed on Lynne’s family farm was rescued and refinished. The Tituses removed a door that had blocked off the maid’s room. A bedroom off of the master bedroom was converted into a walk-in closet, and a door was cut in the wall for easy access. The maid’s bedroom was then converted into a bathroom complete with heated floor since it didn’t have a radiator. Personal touches – especially antiques — abound throughout the house. Some of Lynne’s cross-stitch art adorns the walls, as do some antique bread plates. Hand-painted china on display reflects the Irish heritage that Frank and Lynne share. In the front entryway, visitors see a dollhouse that’s a replica of the farmhouse that Lynne grew up in. There’s a table that was Lynne’s great-grandmother’s and an Edison victrola that belonged to Frank’s grandparents. On the mantel is a photo from Lynne’s grandparents’ 1900 wedding. On the wall near the back door, there are black-and-white aerial photos of the farms where Frank and Lynne grew up and learned their values. “We had great parents, and they taught us how to work,” Frank said. During the three years when the home was undergoing renovation, the Tituses lived in an apartment they built over their garage. The space has a bedroom, living room, kitchen and quilting room where Lynne can work on her hobby. All of the wood in the house is cherry, so Lynne decided she wanted walnut for the apartment’s kitchen cabinets. To make Lynne’s mother feel at home when she stays in the apartment during the winter months, there are paintings of Lynne’s hometown of Elmwood done by a 90-year-old artist there. Frank and his daughter Sarah have a small business called 2 ½ Acres in which they sell fresh produce from his garden. He grows veggies and herbs like cucumbers, green beans, cabbages, peppers, eggplant, potatoes, melons, tomatoes, zucchini, onions, rosemary and Titus Hybrid celery. Frank also grows strawberries, raspberries and blackberries for his wine and plants a butterfly garden with milkweed for Monarch butterflies. The patio area features an outdoor fireplace and some luxuriously upholstered chairs. “We use it a lot,” Frank said. The Tituses love their “new” home. “There’s nothing here we would do a different way,” Lynne said.